Students will time travel to the Age of Reptiles and discover the world of dinosaurs in this vivid, detailed guide. They will trace the development of reptiles through the prehistoric periods of life on earth and learn different theories for the cause of dinosaurs' mass extinction. 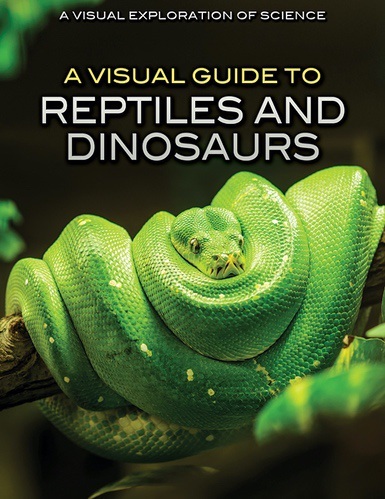 Gorgeous photographs and illustrations will captivate readers as they learn about the hard shells, spiny skin, and telescopic eyes of various animals in the reptile kingdom. The deadly saliva of the komodo dragon, the constrictive power of the tree boa, and the impressive jaws of the crocodile will thrill while the quirky habits and features of geckos, chameleons, and iguanas will charm in this expansive text. Students will also learn the roles that reptiles have played in myths and religions and the trouble that some endangered species face.